Dr. Katherine Schier is our Kalamazoo, MI cosmetic and family dentist, but she doesn’t work alone. Behind the scenes at Kalamazoo Smiles is a hard-working team devoted to providing the best family and cosmetic dental services in Kalamazoo. Read the brief descriptions below to learn about our staff’s training, professional credentials, and work experience. Terra will be at your side working with Dr. Schier to help you get and keep that healthy and beautiful smile. Terra joined our team in September 2016. Nancy work hard to help you keep your teeth and gums healthy for a lifetime. Nancy has been with our team since 1986. Nan loves helping patients achieve the smile of their dreams. She assists our Kalamazoo, MI dentist with oral exams and teeth cleanings. Nan has been on our team since 1991. Linda is our Office Manager and has been part of our team since 1991. Linda is here to help you with scheduling dental appointments, finances, and dental insurance. If you’re a new dental patient, she’s a great resource. Katie is our Office Administrator and joined our team in August 2016. Kristie has worked in the dental field for 10 years. She takes pride in making sure that her dental patients are comfortable during their dental appointments, and she loves to make people laugh and smile. She enjoys all aspects of dentistry, but her favorite procedure is tooth extractions and surgeries, and the reconstruction process of getting people’s smiles back! In her free time, she enjoys spending time with her husband and all of her animals. 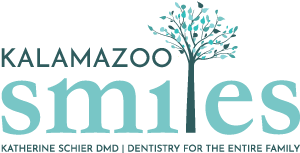 At Kalamazoo Smiles, our team is dedicated to helping you reach your dental goals. Dr. Schier and her staff are always willing to answer questions about our dental technology or any dental procedures you might need. To request an appointment with our Kalamazoo, MI family and cosmetic dentist, give our office a call at (269) 353-3700.